Prominent & Leading Manufacturer from Ludhiana, we offer profile trimmer. 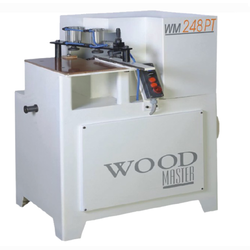 Woodmaster Machines Pvt Ltd is engaged in manufacturing premium quality Profile Trimmer since its incorporation. Our range works efficiently to trim or cut hollow ware items into a specified shape. Trimming is done to give the final touch to manufactured products. The trimmer manufactured by us is compact in design and requires low maintenance.